On July 28, 1750 the great man of faith and church musician Johann Sebastian Bach entered eternal glory. His music reveals to us that he was not afraid of death, but rather welcomed it because he knew it was the door to eternal life with his Savior, Jesus Christ. The Lutheran church pauses on July 28 to commemorate his life, music, and faith. In case you missed it, here is the Portals of Prayer devotion for Saturday, July 28, 2018. 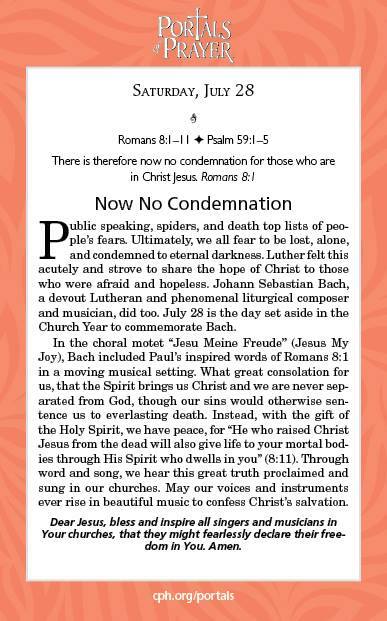 Click on the link below for an incredibly artistic rendition of Bach’s motet “Jesu, meine Freude” (“Jesus, My Joy”) mentioned in the devotion above. The performance is in German. For a translation, visit http://www.bach-cantatas.com/Texts/BWV227-Eng3P.htm.